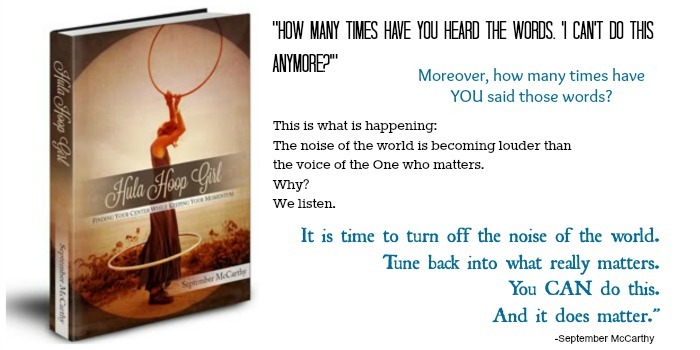 From Hula Hoop Girl, by September McCarthy, mother of ten, YES TEN!! !, children. She knows a few things about trying to keep hoops going. Sometimes we need to reevaluate what we can and can’t do. I’m reading this book right now and it’s been such a blessing to me. I believe it, along with the other books in the Ultimate Homemaking eBook Bundle, will bless you too. You can find it here, but only through tomorrow. Don’t miss out! There are volumes of things that I wish I would have known before I had children. Thankfully I still have younger children, and I’m learning these things now, before it’s too late. Here are some that come to mind as I sit here in a quiet house and they all sleep peacefully in their beds. To enjoy the time that you have with your husband before you have children… you won’t have time like that again for quite awhile, and you’ll miss it. That time goes by so quickly. Prepared to be tired almost all of the time. but it will also bring out the best. That the hard seasons seem to be never ending, but they will pass. The Leggett and Platt Prodigy 2.0 would have helped my back during the pregnancy. To remember the joyous seasons, because they are easily forgotten during those hard seasons. That you may feel like you are doing the most unappreciated job in the world, but it is the most important thing that you will ever do. That your husband and partner is your greatest ally on this earth. Keep that relationship a top priority. That it’s okay to admit that you don’t know what you’re doing… everyone else feels the same way, whether they will admit it or not. Warm moist air for babies will help them breathe easier. It seems impossible, but each year passes more quickly than the last, until you feel like one year passes will soon pass in the blink of an eye. That it’s okay to put your kids first. Society tells us that we need to take care of ourselves, and we do, but we only have these gifts for a short time. Pour into them while you can, because they will be grown and gone before you know it. What In The World Is Natural Parenting? There’s no denying that “Natural Parenting” seems to be the trend these days. There are magazines racks and book shelves dedicated to the subject. You’ll find blog after blog after blog penned by mothers and fathers that extol the virtues of natural parenting, and I love that there is so much information out there on the subject. Here’s the thing… no one can seem to agree on what natural parenting actually means. When I started cloth diapering our second child people looked at me like I had lost my mind. Why in the world would I cloth diaper? Isn’t that gross? Well, no, it’s not. Believe it or not I even convinced a few new mothers that cloth diapering might be the way to go for them too! It’s interesting though, that when people hear that you cloth diaper they assume that you also make your own baby food, grow your own vegetables (organically, of course), don’t vaccinate, don’t wear deodorant… basically you’re a hippy. The cherry on top was when I told them that I had all three of my children without drugs! That blew their minds. I’ll admit that I have tried, at one time or another, all of those things. I tried making my own baby food, but that didn’t last long. I opted for store bought organic baby food and didn’t feel guilty about that at all, although it went against what I thought needed to happen for me to follow a natural parenting lifestyle. We have a tiny raised bed garden just about every year and really enjoy what veggies we harvest. The kids love seeing the fruits of our labors and think it’s awesome to eat the food that we’ve grown. Personally tutoring your child works wonders. It develops a better relationship and creates a touch stone for you and your kids. I do wear deodorant… you’re welcome. I try to use a natural brand as often as possible (haven’t tried making my own yet), but sometimes the natural deo just doesn’t cut it. Do I consider what my husband and I do to be natural parenting? Honestly I have no idea! There seems to be a Natural Parenting spectrum, don’t you think? I feel like there are many things that we do as parents that would go along with the natural parenting philosophy: natural childbirth (although not at home, I gave birth naturally in the hospital), exclusive breastfeeding, organic baby foods, some cloth diapering, growing a small percentage of our own veggies, selective vaccinations, etc. Heck, we’re about to embark on a homeschooling journey with our daughter this coming school year! But I would venture to say that to some Natural Parenting advocates what we do is not enough. To others we may seem far along on the spectrum. Sometimes I feel like labeling parenting styles discourages people from parenting from their hearts. I wonder if I’m the only one who feels this way. What comes to your mind when you hear or read the term Natural Parenting? Another Gluten Wake Up Call. Just when we thought that Levi might be growing out of his gluten sensitivities we have once again been reminded that this youngest son of ours is far more sensitive to gluten than anyone else in our family. As a baby Levi’s gluten sensitivity showed up as eczema all over his face and also on his neck and arms. Later on, around ages two and three, it caused allergy symptoms and asthma flare ups. We spent more than a few times in the emergency room or the doctor’s office before we realized the connection. Lately we noticed that those symptoms were not happening so much anymore. We hoped that he was growing out of his sensitivities so we decided to gradually allow him to have some foods that contained gluten. It seemed that all was going well, as far as we could tell. No eczema on his face and he hasn’t had any asthma flare ups in quite awhile This is unusual, especially with the onset of a cold. The last cold that he had I was just waiting for the asthma symptoms to hit. but they never did. I was so excited! What I neglected to look for were other possible symptoms, so when Levi started to complain of tummy pains every so often, I just chalked it up to gas pains. He also started to say that we was having burps and that when he did he had throw up in his mouth. Hmmm. That was a little bit strange, but not strange enough for me to put two and two together, because I just wasn’t looking for it. The kicker came last Wednesday at Bible Study when I was called out of my small group. Levi had thrown up in his class. Not too alarming given the viruses that seem to be running rampant in this town recently. This didn’t act like a virus though. Levi didn’t have a fever, a runny nose, a cough, a sore throat, or any other symptoms. In fact, he was acting perfectly normal, and didn’t vomit again for the rest of the day. Later that night, at about 9:30 or so, he vomited in bed (showing EXTREME self control for a four-year-old and not even getting it anywhere until I came running with a bowl). It was then that I started to wonder if maybe his gluten sensitivities were showing themselves in a new way. I thought back to all of the tummy complaints and the digestive issues and realized that the last couple of weeks had been leading up to this. I even spoke to a friend (via text) who said that she had recently come off of her gluten free diet and had experienced those exact same symptoms. I felt terrible for not making the connection sooner. As soon as we got home from church that morning we went back to a completely gluten-free diet, and with the exception of the night time episode, he hasn’t been sick since and has only complained of tummy pains once, soon after. I haven’t heard of any nasty burps either. This journey through gluten sensitivities is new to us. Although I have allergies to everything under the sun, we have never dealt with food allergies or food sensitivities in our family. It’s definitely a learning process for me my husband. Levi has not been formally diagnosed with a gluten intolerance, but it’s obvious to us that his body cannot handle it very well. It’s out job to make sure that we take care of his nutritional needs and help him to learn what his body can and cannot handle. He is such a great sport about it too! You’d think a four year old would complain and whine about not being able to have the treats and foods that he would like to have. Some of his favorite things have gluten in them, and when I tell him that he can’t have them anymore because they will make his body sick he just says, “Okay, I will never eat that again!” He’s very proactive about it all. We are blessed with a very sweet child. Tell me, are you a gluten free family? What are some of your favorite gluten free products? Cloth Diapering Help is Here! Natural Moms and Moms to Be! I’m so excited to tell you about the latest project from my friend Erin at The Humbled Homemaker. Today Erin launches her latest eBook release, Confessions of a Cloth Diaper Convert, and I have to say that I really wish that this book was out about 6-1/2 years ago when I was researching cloth diaper options. I was pregnant with Luke and really wanting to cloth diaper, but I had no clue what I was doing or getting into. Maybe you are in that place right now? I spent weeks, possibly months, on the internet reading about my options. 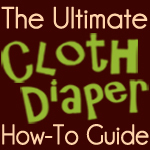 I read about different types of cloth diapers, how much they cost, and how to care for them. I stressed over which diapers to buy because we didn’t have any stores in our town where I could go to actually get my hands on any of the newer updated pocket diapers. I was so overwhelmed! You are in luck! Erin has done ALL of the research and trial and error for you! She has made every cloth diapering mistake in the book. She has worked for a cloth diapering store. She has trouble-shooted for other mothers, helping them to find the perfect fit to their babies’ cloth diapering needs. And she has saved her family thousands of dollars by ditching disposable diapers! Now she has written the book! This week only Erin is offering a HUGE deal when you buy Confessions of a Cloth Diaper Convert for the introductory price of $9.95. By the way, $9.95 is less than the cost of using disposable diapers for one week… this is worth the try! A free baby sling from Seven Slings($48 value!). A free nursing pillow from Nursing Pillow ($39.95 value!). A free carseat canopy from Carseat Canopy ($49.95 value!). Can you believe these bonuses! If you are a new mother or an expecting mother, these products are all things that you will find that you cannot live without. If you ask me they are definitely worth the cost of shipping, no doubt! A New Breastfeeding Mother’s Dilemma. I was texting with a good friend the other day and I haven’t been able to stop thinking about our conversation since then. She had shared with me about a breastfeeding mom who had returned to work and was pumping full time to feed her child who was now in daycare. Good for her! Her supply is great, the baby is well fed and taking the bottle beautifully. Then she takes her child to the well check up at her pediatrician’s office and what does he say? That it’s wonderful that she’s doing this, but she has a lot on her plate, so don’t be a martyr about it. He tells her that he is interested in everyone’s physical and mental health, soooooooo just in case…… here’s some free formula!!! What??? I’m told that now the mother is concerned that maybe she is not making enough milk for her baby after all, when there is no indication that this is true. The baby is perfectly healthy. This mother’s breastfeeding relationship has been sabotaged and her confidence as a new mother has been shaken and that saddens me greatly! I’m going to take a stab in the dark here and guess that this new mom’s mental health was not better off upon leaving the doctor’s office that day. She walked in a confident young mother who was taking wonderful care of her child, and she left doubting her ability to adequately care for her baby. The pediatrician in this situation claims to be concerned about the health and wellness of the child, and I’m sure that in a general sense he is, but do you care to know what the first two ingredients are in the formula that he so freely gave to the mother? Corn Syrup and Sugar. That’s right- Corn Syrup and Sugar, because obviously this must be better for babies than breastmilk. Are you kidding me? Please don’t take this the wrong way. I know that there are mothers out there that choose not to breastfeed or who are not able to breastfeed, and I am fully supportive of their right to choose how they feed their babies, but to believe the lie that formula is equal to or superior to breastmilk in nutrition is just ridiculous. Formula will never be equal to breastmilk in any way, shape, or form. For a doctor to act like taking a bottle of formula is better for a baby than being fed breastmilk should raise serious red flags in a parent’s mind. I would be seeking another doctor’s care immediately. According to a study in Pediatrics (February 2011), formula fed babies who started solids earlier than 4 months are 6 times more likely to become obese by age three, compared to formula fed babies who started solids later. This study followed 847 babies. Well, you may say, babies aren’t supposed to start solids that early! True, but although the American Academy of Pediatrics recommends that parents not introduce solid foods into their baby’s diet until between 4 to 6 months of age, 26% start their babies on solids by four months old. Interestingly enough, breastfed babies are at no higher risk of obesity, regardless of when solid foods are introduced into the diet, according to the same study. In 2005 a study in the Journal of the American Medical Association estimated that the childhood obesity rate could be cut by 15-20%, simply by switching formula fed babies to breast milk. That is amazing! And yet medical doctors are constantly pushing formula on mothers and babies, all in the name of the health of the baby! Pediatricians are wonderful people and we love the pediatricians who take care of our children, but I have the final say in my child’s health and well-being. Whether you want to admit it or not, doctors are influenced by pharmaceutical companies and YES, formula companies too! Why do you think they push the stuff on us from the moment babies are born in the hospital? Your body was created to provide for and nourish your child. Your breasts are not for show, they have a function and a purpose… they are amazing! Lactating mothers were meant to be the sole source of nourishment for their children, so please do not doubt your ability to be this for your child. If you would like more information on breastfeeding your child, please read my Breastfeeding 101 Series. Pregnancy and Childbirth Books that I Love. I thought I’d share with you some of my favorite pregnancy and childbirth books. There are so many resources out there. Some are great… some not so much. In fact, there is one extremely popular pregnancy book that I hated and will not recommend to my clients or readers (nope, I won’t name it here, that would be rude). I have a short list of my favorites pregnancy and childbirth books though, that I recommend over and over again. I have read them myself and found them very informative and useful. Taking Charge of Your Fertility by Toni Weschler. This is a must-read for every woman, whether she is trying to get pregnant or not. Toni informs the reader on everything that she needs to know about her reproductive system and cycle, as well has how to chart fertility and how to avoid pregnancy naturally. Somehow she does this in a funny and easy to read way. I love this book! You can also visit the website here, it’s a great resource. What I love about this book is that each chapter addresses a different aspect of birthing and does so with a lot of well-researched, accurate, and unbiased information. This book covers everything that you want to know about birth. Henci Goers website can be found here. Ina May is the world’s leading midwife and founder of The Farm, in TN. She has included birth stories and practical advice with her mother-centered philosophy on childbirth. Another must read! You can find Ina May’s website here. This is the book that I wish I had read before my first child was born. When I found it I read it cover to cover. “It covers all aspects of childbearing from conception through early infancy. It includes information on what to expect during pregnancy and birth and how you can work with your caregivers to make childbirth a happy and healthy experience.” (From Amazon.com) Penny Simkin has been a childbirth educator since 1968 and she holds a wealth of information that she generously shares in her book. You didn’t think I’d leave this one out did you? This one is near and dear to my heart. 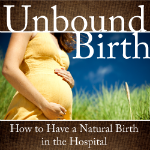 If you’re reading this post, then you most likely are interested in natural birth options, and this book will give you the information and encouragement you need to have the natural hospital birth that you desire. These are just a few of the books that I recommend every new mother read when she finds out that she is pregnant. Like I said, there are many books out there vying for your time and attention. These will give you a good start as you begin exploring your birth options and progress through your pregnancy. Place fruit in a saucepan and cover it with water (about 1/4″ above the fruit). Bring to a boil. Reduce heat and cover. Simmer for 5 minutes. Drain and puree. Bring water to a boil. Add banana, cereal, and berries. Reduce heat and simmer for 5 minutes. Puree. Breastfeeding 101: Breast Milk Storage Guidelines. Many women choose to breastfeed their babies for an extended period of time. Chances are, if you do, you’ll find yourself pumping breast milk at some point. It’s funny, but I always had a hard time pouring breast milk down the sink drain… it wasn’t just a waste, it was personal. 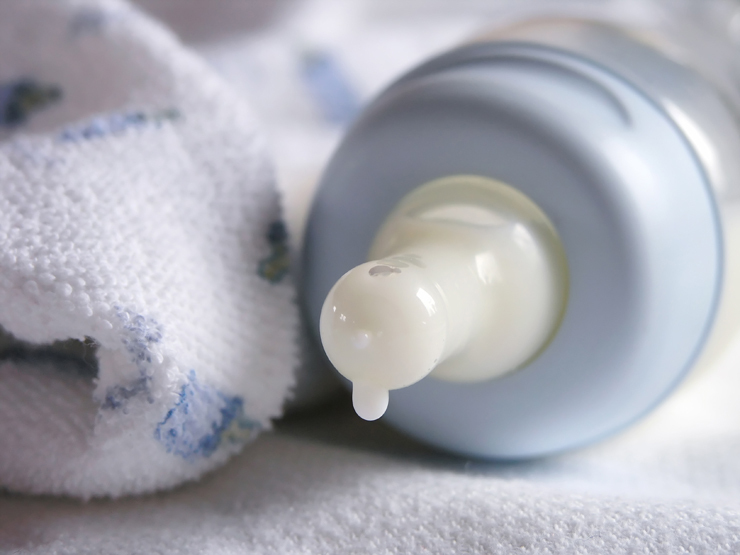 So what do you do with breast milk when you pump and don’t use it right away? If you are planning to use the milk within 4-24 hours you can store it in a bottle (see guidelines below). If you plan to freeze it, just about every bottle manufacturer sells breast milk storage bags that are made expressly (pun intended) for this purpose. Make sure that you seal the bag well before putting it in the refrigerator or freezer. To thaw frozen breastmilk, run warm (not hot) water over the bag until the milk has thawed. Once breast milk is thawed it must be used immediately or it can be stored in the refrigerator for up to 24 hours. It cannot be stored in the refrigerator or the freezer again.